This is the finest and most richly illuminated extant manuscript of the version called “Prose 1” of the Romance of Troy, which is the earliest great rendering of the Trojan legend in the French language. Its miniatures are by the artist known as the Master of Girart de Roussillon, named after the manuscript in Vienna of the Roman de Girart de Roussillon. This is the finest and most richly illuminated extant manuscript of the version called “Prose 1” of the Romance of Troy, which is the earliest great rendering of the Trojan legend in the French language. Its miniatures are by the artist known as the Master of Girart de Roussillon, named after the manuscript in Vienna of the Roman de Girart de Roussillon. Probably identical with Dreux Jean, this rare and accomplished illuminator worked for the court of the dukes of Burgundy, and this manuscript must also come from the ducal circle. The addition of a newly attributed manuscript to the elusive and incomparable Master himself is a major event in the scholarship of southern Netherlandish art. This is probably the finest manuscript of Trojan romance ever likely to be sold again. 3 paper flyleaves + 109 folios on parchment + 3 paper flyleaves, lacking 13 leaves (one blank), modern pencil foliation 1-122 in upper outer rectos takes account of missing leaves (although they were already missing before the book was foliated), collation: i8, ii7 [of 8, lacking i = ‘9’], iii-iv8, v7 [of 8, lacking v = ‘37’], vi6 [of 8, lacking iii and v = ‘43’ and ‘46’], vii ix8, x6 [of 8, lacking iv-v = ‘76’-‘77’], xi6 [of 8, lacking ii and vi = ‘82’ and ‘86’], xii6 [of 8, lacking i and vi = ‘89’ and ‘94’], xiii7 [of 8, lacking viii = ‘104’, with missing text copied into the lower margin of fol. 103v], xiv7 [of 8, lacking vii = ‘118’], xv9 [of 10, lacking x, blank at end], with horizontal catchwords; ruled in pale red ink, justification 212 x 150 mm., two columns of 34 lines, written in dark brown ink in a professional slightly sloping lettre bâtarde, some first and last lines (especially at ends of quires) with elaborate decorative cadels extending far into upper and lower margins, headings in bright red; two-line initials throughout in burnished gold on red and blue grounds with white tracery and marginal sprays of pairs of gold leaves within black penwork, some illuminated line-fillers at ends of paragraphs; seventeen large miniatures with richly illuminated borders of colored acanthus leaves and burnished gold bezants and bryony leaves within brown penwork, one miniature 2 columns wide (folio 60r), seven miniatures spreading into the adjacent column and sometimes into the margins as well, four other columnwidth miniatures spreading into one or more margins; some wear, some miniatures a bit rubbed with minor loss of pigment and spots of smudging, occasionally extremities of wide illuminated borders slightly cropped, some stains and creasing and signs of thumbing, first outer margin slightly frayed, generally in sound and often excellent state for a much-used secular text; bound in old (seemingly even contemporary) reversed skin over pasteboards sewn on 4 thongs, paper pastedowns, rebacked with old spine laid on, old MS spine title “GUER/RE DE TROIE”, in an English full red morocco fitted case gilt. Dimensions 310 x 230 mm. The romance of the siege and destruction of Troy and the diaspora of the Trojans is the greatest literary text of Antiquity, both in Greek and Latin. It became the supreme aspiration of the Middle Ages to claim descent from the chivalric knights of Troy. The origins of Rome were traced to Aeneas; Britain was reputedly so-called after Brutus of Troy; Paris was named after the Trojan prince whose abduction of Helen led to the war; and Troyes was to be the new Troy. The first printed book in the English language was a Trojan romance (c. 1474). Above all, the fifteenth-century Dukes of Burgundy reveled in their supposed descent from the Trojans and they promoted it unceasingly. The library of Philip the Good, duke of Burgundy 1419-1467, included seventeen manuscripts on the history of Troy, and at least ten copies were owned by his successors Charles the Bold (1467-1477) and Philip the Handsome (1482-1506) (A. Bayot, La légende de Troie à la cour de Bourgogne, Bruges, 1908; J. Barrois, Bibliothèque Prototypographique, Paris, 1830, pp. 143- 45 and 239-41). Since the artist of the present manuscript was a full-time employee of Charles the Bold (see below), it is by no means impossible that this manuscript too was destined for the ducal library. At the very least, it is the finest surviving manuscript of a text consciously promoted from within the Burgundian court. The earliest great working of the Trojan legend in the French language was the twelfthcentury Roman de Troie of Benoît de Sainte-Maure, in just over 30,000 lines of epic verse. In the thirteenth century, this poem was rendered for the first time into French prose, perhaps to add credibility to what might have been dismissed as fiction when chivalric romance became paramount during the Crusades. That original version, known to literary historians as “Prose 1,” is the text represented by the manuscript here. The author claims to have written it in the Morea, now the Peloponnese peninsula, then a Frankish principality. It opens with a description of the geography of the eastern Mediterranean, followed by the legend of Jason and the Golden Fleece which resulted in the first destruction of Troy, the romance itself from Benoît de Sainte-Maure through to the return and death of Ulysses, and finally a short continuation taken from the romance of Landomata, son of Hector, who returned to Troy and re-established a knightly kingdom. All these are characteristic of the “Prose 1” version. 3. Formerly Tours, Bibliothèque municipale, MS 954, dated 1358, on paper, no miniatures; destroyed 19 June 1940. 5. Maredsous, Bibliothèque de l’Abbaye, MS fo 26, mid-fifteenth century, on paper, 67 colored drawings. 10. Paris, Bibliothèque nationale de France, MS nouv. acq. fr. 11674, late fifteenth century, on paper, space left for one miniature never added. 13. Berlin, Staatsbibliothek, Cod. Hamilton 340, fifteenth century, incomplete, spaces left for 17 miniatures never added. 14. Cambridge, Trinity College, O.4.26, incomplete, 7 surviving miniatures (of 10). 15. Paris, Bibliothèque nationale de France, MS fr. 785, spaces left for 12 miniatures never added. 16. Paris, Bibliothèque nationale de France, MS fr. 1631, dated 1485, on paper, incomplete, no miniatures. 17. Paris, Bibliothèque nationale de France, MS fr. 24401, fifteenth century, incomplete, 23 miniatures with drawings and spaces left for others never added. 18. Saint Petersburg, Rossijskaja Nacional’naja Biblioteka, fr.F.v.XIV.12, early sixteenth century, 18 coloured drawings. 19. The manuscript listed by Jung on p. 442 as “Ophem, Bibl. du comte Hemricourt de Grunne (XVe s.)” on which no information appears to be published and may, in fact, be the present manuscript if it was acquired by that collection in 1938. Every one of these, with the possible exception of the last, is in the inalienable possession of a European public collection. None is outside Europe. No other has come to the market since the present copy was sold in 1938. Each copy is slightly different and every one contributes to knowledge of the text; this manuscript has never been studied firsthand by any literary scholar. The manuscript is missing 13 leaves. At least nine of the manuscripts above are also incomplete. The report of our copy by Constans (1912) cites its nineteenth-century owner as claiming that it had “environ 150 pages” (around 150 pages) and “une quarantaine” (approximately 40) fine miniatures. The former is only a guess (the complete manuscript had 122 folios) and, even if every missing leaf had a picture, which is unlikely, it can never have had more than 30, not 40. The numbers of leaves and miniatures now are exactly as they were when the manuscript was described by Quaritch in 1898. In fact, one missing miniature from the present manuscript survives. It is B-13.519 (1946.21.9) among the Rosenwald cuttings in the National Gallery of Art in Washington, D.C. (Nordenfalk et al, 1975, pp. 185-87, no. 47), showing the meeting of Achilles and Hector. It belonged the collections of Edouard Warneck (1834-1924) and Arthur Sambon (1867-1947) before passing to Léonce Rosenberg by 1913. It is a fragment, cut close to the picture, not a whole leaf, which suggests the collecting taste of the earlier nineteenth century. The fragments of text on its verso correspond to parts of folios 75v and 76r of British Library Add. MS 9785 (no. 12 on the list above), which allows us to match it as part of the missing leaf 43 of the present manuscript. That fact was hitherto unknowable. With the Washington cutting, the present manuscript had a cycle of at least eighteen miniatures, and probably more. This is almost unprecedented among manuscripts of the “Prose 1” text. Most are relatively humble copies. At least eight are on paper. Four have no pictures at all and six have spaces left for miniatures never completed. Only two have a larger repertoire of illustrations, no. 1, with twenty-five small thirteenth-century historiated initials, and no. 5, a paper manuscript with sixty-seven sketchy colored drawings. Judged at least from the standpoint of a luxury copy on parchment with fully colored and illuminated pictures, (this is even in its present condition) the finest and richest manuscript of the text extant. There are two or possibly three closely related hands in the miniatures here. We are immensely indebted to Professor Gregory Clark for his identification of the two principal hands as the illuminator known as the Master of Girart de Roussillon, who was almost certainly the documented illuminator to Philip the Good, Dreux Jean, also known as Dreux Bachoyer, who was appointed as court artist to the dukes of Burgundy in 1448 and remained in post until he was succeeded by Philippe de Mazerolles in 1467, the probable year of his death. Coincidentally, the attribution of the manuscript’s missing miniature in Washington to Dreux Jean/Master of Girart de Roussillon was made independently by Hanno Wijsman on the TELMA database, “Luxury Bound,” no. 3639. 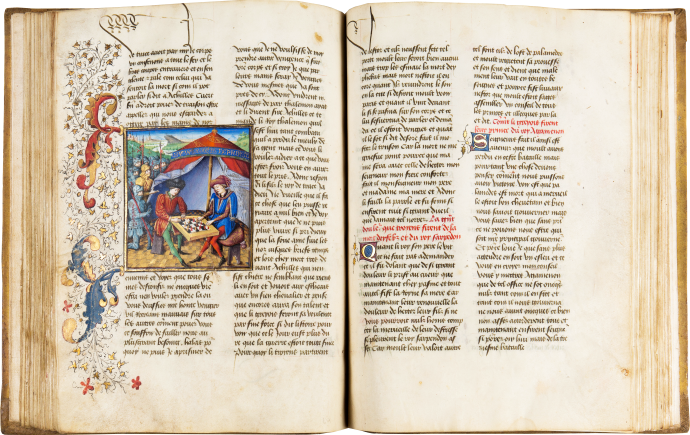 The Master is named from an incomparable manuscript of the Roman de Girart de Roussillon made for Philip the Good in 1448, now in Vienna (ÖNB, cod. 2549), which is illuminated by the same artist as a roll chronicle of Jerusalem also made for the duke soon after 1455, also in Vienna (ÖNB, cod. 2533). Both are secular manuscripts of universal fame and astounding painterly quality. “The Girart Master’s style is notable for its fusion of the traditions of Parisian illumination and south Netherlandish panel painting, as well as echoes of the work of both the Bedford Master and Rogier van der Weyden. Sophisticated landscapes, fine portraiture, an intense palette, and the distinctive juxtaposition of unblended colours are the hallmarks of the Girart Master’s work” (McKendrick, Illuminating the Renaissance, 2003, p. 212). “In some cases he proves himself an excellent portrait painter, almost a rival of Rogier van der Weyden” (Dogaer, Flemish Manuscript Painting, 1987, p. 77). Anne van Buren called him simply the finest artist of his generation (“Dreux Jean and the Grandes Heures of Philip the Bold,” 2002, p. 1403). The case for identifying him with Dreux Jean hinges on the historical likelihood of the court painter from 1448 being the principal artist of two of the duke’s greatest manuscripts from that period and from two miniatures added in the Grandes Heures of Philip the Bold (Cambridge, Fitzwilliam Museum, MS 3-1954, fols. 238v and 256r), a manuscript documented as updated in 1451 by several artists, including Dreux Jean. The identification is accepted as overwhelmingly probable but just short of proven. Dreux Jean was born in Paris and was working in Bruges before his appointment as illuminator to Philip the Good in 1448. In 1449 he was the duke’s valet de chambre, and he was salaried as court illuminator to the prince of Valois until 1454. In 1464, Charles the Bold renewed his contract as ducal illuminator and valet de chambre. Professor Clark emphasizes to us the identity of the principal artist here with that of the finest paintings of the Roussillon itself and the Jerusalem chronicle. This is important, for there is a widening circle of manuscripts in related style but not necessarily all by the same painter. The probability is that the Master of Girart de Roussillon directed an intimate workshop. The absolute core work by his own hand is perhaps no more than three or four manuscripts, in Vienna and Brussels. The only manuscript of the larger group outside continental Europe is Los Angeles, J. Paul Getty Museum, MS Ludwig XI.8, almost certainly no closer than very loosely in the style of the workshop. The addition of a newly attributed manuscript to the elusive and incomparable Master himself is a major event in the scholarship of southern Netherlandish art. The Master of Girart de Roussillon executed the miniatures here on folios 1r, 4v, 14r, 17r, 18v, 50v, 52r, 63v and 107r. These are superbly colored paintings showing rich costumes and intimacy of human interaction, set in luminous landscapes. The same artist probably painted the miniatures on folios 7r, 69v, 119r and 120v. A recognizably different artist but working within the Master’s style produced the miniatures on folios 60r, 61v, 84v and 106r. These enchanting scenes are everything that popular imagination associates with the romance of the Middle Ages, including kings and princes, damsels and queens, ships, castles and chivalry. The manuscript is rich in details of costume and courtly regalia, as ancient myth is reset into the landscape of the Netherlands. The image of Achilles and Ajax playing chess, reproduced in all three sale catalogues of 1931-37, is one of the finest medieval depictions of the game. When this manuscript was first offered for auction in 1931, the catalogue broke into capitals, “FINELY ILLUSTRATED LITERARY MANUSCRIPTS OF THE BURGUNDIAN SCHOOL ARE EXCEPTIONALLY RARE” and, if that was true then, they are incomparably rarer on the market now nearly 90 years later. This is probably the finest manuscript of Trojan romance ever likely to be sold again. 1. Folio 1r, Philosophers instructing a king, perhaps King Laomedon, who is seated below a canopy in a gothic throne room, 16 lines, 100 x 75 mm. ; two-sided floral border including a putto with a trumpet and a lion-footed grotesque in the foliage with pendulous breasts and a hat lined with ermine. 2. Folio 4v, Medea the sorceress, daughter of King Aeëtes, seated on a bench in a gothic room in conversation with Jason, with whom she falls in love, attended by an armed knight, 14 lines, 89 x 72 mm. ; two-sided floral border including apes attacking each other with spear and bow and arrow and an angel playing a lute. 3. Folio 7r, Jason seizing the golden fleece, having immobilized the sleepless dragon by drugging it and having killed Apsyrtus, brother of Medea, who watches from the battlements of a castle, set in a landscape with Jason’s ship, the Argo, in full sail by the shore, 13 lines, 82 x 73 mm. ; two-sided floral border. 4. Folio 14r, King Priam enthroned below a canopy, in conversation with his sons Hector, Paris, Deiphobus, Helenus and Troilus, 19 lines, 118 x 81 mm. ; two-sided floral border including an archer shooting an ape and a Wildman grasping foliage. 5. Folio 17r, Paris (in golden armor) and other Trojan knights despoiling the temple of Venus and kidnapping Queen Helen, the most beautiful woman in the world, 16 lines, 100 x 85 mm. ; floral border extending into two margins. 6. Folio 18v, Menelaus, jilted husband of Helen, in conversation with his brother Agamemnon, meeting on horseback in a landscape attended by other Greek noblemen, 15 lines, 97 x 76 mm. ; floral border extending into two margins. 7. Folio 50v, Diomedes visiting and falling in love with Cressida, daughter of the seer Calchas, set in a tent in a landscape with Diomedes’ horse waiting behind, 17 lines, 108 x 81 mm. ; floral border extending into two margins. 8. Folio 52r, Andromache, wife of Hector, pleads with her parents-in-law King Priam and Queen Hecuba and points to her infant son Astyanax who lies on the ground, set in a gothic parlor, 14 lines, 92 x 75 mm. ; marginal floral border. 9. Folio 60r, The funeral of Hector, with the Trojan kings and noblemen and women gathering in sorrow around his tomb, 18 lines, two-column, 120 x 151 mm. ; marginal floral border. 10. Folio 61v, Achilles in his tent listening to and falling in love with Polyxena, daughter of King Priam, who kneels before him, set in a landscape of castles, 16 lines, 106 x 103 mm., marginal floral border. 11. Folio 63v, The legate of Achilles negotiating with Queen Hecuba in her bedroom, while a maid sits on the floor playing with a dog, 16 lines, 103 x 98 mm. ; marginal floral border. 12. Folio 69v, Achilles and Ajax playing chess in a tent, as Trojan knights in gold and silver armor remonstrate at their idleness, 16 lines, 103 x 92 mm. ; marginal floral border. 13. Folio 84v, A messenger receiving orders from Queen Hecuba who lies on her bed planning vengeance for the deaths of her sons, set in a castle with women listening at the door, 21 lines with extension into two margins, 166 x 126 mm. ; floral border including grapes extending into three margins. 14. Folio 106r, The Greeks arresting Polyxena, who was being held as hostage, and debating whether she should be sacrificed at the end of the Trojan War, set in a castle hall, 21 lines, 130 x 123 mm. ; floral border extending into two margins. 15. Folio 107r, Queen Hecuba being stoned beside the golden tomb of Achilles, attended by a large number of noblemen and women, 20 lines, 131 x 133 mm. ; floral border extending into three margins. 16. Folio 119r, Landomata, son of Hector, returning to Troy and ordering the execution of Calchas, who is hanged from a tree, 20 lines with marginal extension, 187 x 143 mm. ; floral border in lower margin. 17. Folio 120v, Landomata imprisoning the king of Armenia in a white tower and taking the throne for himself, 20 lines, 130 x 119 mm. ; floral border extending into two margins. 1. Doubtless written for a member of the court of the dukes of Burgundy, possibly Charles the Bold himself, for whom reputed descent from the Trojans was paramount. The arms hanging on the tent in the miniature on folio 61v, quarterly or and azure, were borne by the family of Tournemine of Brittany and it has been suggested that the manuscript was illuminated for Gilles de Tournemine (d. 1474), celebrated soldier and patron of British Library, Harley MS 5781. However, the arms are not shown in a position of proprietorship and the manuscript is not Breton. There was a branch of the family of Tournemine in Lille, principally mercers, which is at least geographically more plausible. Léopold Constans proposed instead that the manuscript may have belonged to the library of the Château de Montbeton, near Montaubon, close to where it was first recorded in the nineteenth century: the inventory of its very small library in 1495 included a “Histoire de Troie.” The château was then owned by the family of St-Étienne. 2. There are nineteenth-century inscriptions on the flyleaf and pastedown, “Capus” and “Capus au Théron, comune de Cestayrols,” probably Jean-Antoine-Raymond-EuzèbeProsper-Grégoire Capus; he was born 1829 and was still head of the family when A. B. Bardou published his Famille Capus, du Théron-sur-Cestayrols (Tarn), Albi, 1898. Théron was then a village of only 24 houses, where the Capus family had lived since at least the time of Pierre Capus de Théron around 1600. It is approximately 14 km. north-west of Albi in southern France. In 1894 the Capus family unsuccessfully offered the manuscript for sale to the Bibliothèque nationale. 3. Bernard Quaritch, London, Manuscripts, Bibles and Liturgies, cat. 176, January 1898, no. 22, at the then considerable price of £440. 4. John Thomas Adams (c.1849-1931), manufacturer of polishes, Sheffield; his sale, Sotheby’s, 7 December 1931, lot 59, with folding plate. 5. William Harrison Woodward (1856-1941), Professor of Education, University of Liverpool; his sale, Sotheby’s, 14 June 1937, lot 508, with color plate; bought by the London bookseller, G. Michelmore; his Rare and Choice Books … including the Tournemaine Illuminated Ms. of the Roman de Troie, cat. 27 (1938), no. 148, and color frontispiece. 6. Private collection, small gilt book label of a rising bird, MS 6. L. CONSTANS, Le Roman de Troie par Benoît de Sainte-Maure, publié d’après tous les manuscrits connus, VI, Paris, 1912, pp. 271-72. B. WOLEDGE, Bibliographie des Romans et Nouvelles en prose française antérieurs à 1500, Publications Romanes et Françaises XLVII, Geneva and Lille, 1954, p. 126. C. NORDENFALK, WITH C. FERGUSON, D. S. STEVENS SCHAFF AND G. VIKAN, Medieval and Renaissance Miniatures from the National Gallery of Art, Washington, 1975, pp. 186-87. M.-R. JUNG, La légende de Troie en France ay moyen âge, Analyse des versions françaises et bibliographie raisonnée des manuscrits, Romanica Helvetica 114, Basel and Tübingen, 1996, pp. 442 and 466. A. M. GAUTHIER, “Édition et étude critique du ‘cycle des Retours’ du Roman de Troie de Benoît de Saint-Maure,” PhD diss., University of Montréal, 1997, p. 339. M. GIL, “Le cycle d’illustration du Roman de Troie en prose be Benoît de Sainte-Maure dans le milieu bourguignon,” in J.-C. Herbin, ed., Richesses médiévales du Nord et du Hainaut, Valenciennes, 2002, pp. 155-83, at pp. 165-66. F. VIELLIARD, “Du Roman de Troie à la ‘vraie estoire de Troie’ (Prose 1, version commune): le choix de l’Histoire,” in L. Harf-Lancner et al., eds., Conter de Troie et d’Alexandre, Pour Emmanuèle Baumgartner, Paris, 2006, pp. 177-93, at p. 179, n. 11. D. E. BOOTON, Manuscripts, Market and the Transition to Print in Late Medieval Brittany, Farnham and Burlington, 2010, p. 283. BOSSUAT, R. Manuel bibliographique de la littérature française du Moyen Âge, Paris, 1955, p. 88, nos. 6795-96. CASPAR, G., AND F. LYNA, Philippe le Bon et ses beaux livres, Brussels, 1944. CROIZY-NAQUET, C. “Le Roman de Troie en prose et le monde païen antique,” Études médiévales 4 (2002): 197-205. DOUTREPONT, G. La littérature française à la cour des ducs de Bourgogne, Paris, 1909. DURAND, C. “L’illustration du Roman de Troie et de ses dérivés dans les manuscrits français,” PhD diss., École des hautes études en sciences sociales, Paris, 2003. ROCHEBOUET, A. AND A. SALAMON, “Les échecs et la cite de Troie,” La règle du jeu, Questes 18 (2010): 30-43 (available online). TANNIOU, F. “‘Raconter la vraie estoire de Troie,’ Histoire et édification dans le Roman de Troie en prose,” PhD diss., Université de Paris X-Nanterre, 2009. DOGAER, G. Flemish Manuscript Painting in the 15th and 16th Centuries, Amsterdam, 1987, pp. 77-83. CLARK, G. “Le Maître du Girart de Roussillon (Dreux Jeahan),” in B. Bousmanne and T. Delcourt, eds., Miniatures flamandes, 1404-1482, Paris and Brussels, 2011, especially pp. 188- 91. KREN, T., AND S. McKENDRICK, Eds., Illuminating the Renaissance, The Triumph of Flemish Manuscript Painting in Europe, Los Angeles, 2003, pp. 212-16. PÄCHT, O., U. JENNI AND D. G. THOSS, Flämische Schule, I, Die Illuminierten Handschriften und Inkunabeln der Österreichischen Nationalbibliothek 6, Vienna, 1983, esp. pp. 50-51. VAN BUREN, A. “Dreux Jean and the Grandes Heures of Philip the Bold,” in B. Cardon, J. Van der Stock and D. Vanwijnsberghe, eds., ‘Als ich can’, Liber Amicorum in Memory of Professor Dr. Maurits Smeyers, Corpus of Illuminated Manuscripts from the Low Countries 9, Louvain, 2002, pp. 1377-1414. WIJSMAN, H. Luxury Bound: Illustrated Manuscript Production and Noble and Princely Book Ownership in the Burgundian Netherlands (1400-1550), Turnhout, 2010 (and associated corpus compiled for the online database www.cn-telma.fr//luxury-bound).